Aruba is a 33 km (21 mi) long island in the southern Caribbean Sea, north of Venezuela. 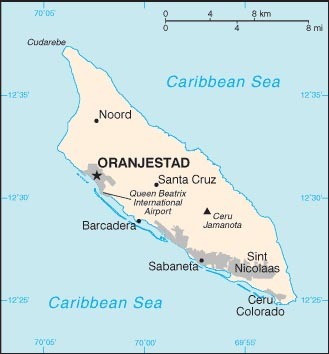 Aruba seceded from the Netherlands Antilles in 1986 and became a separate, autonomous member of the Kingdom of the Netherlands. Aruba is renowned for its white, sandy beaches on the western and southern coasts of the island, relatively sheltered from fierce ocean currents. Aruba has a dry climate and has helped tourism as visitors to the island can reliably expect warm, sunny weather. Tourism is the mainstay of the small, open Aruban economy, with offshore banking and oil refining and storage also important. The rapid growth of the tourism sector over the last decade has resulted in a substantial expansion of other activities. Over 1.5 million tourists per year visit Aruba. 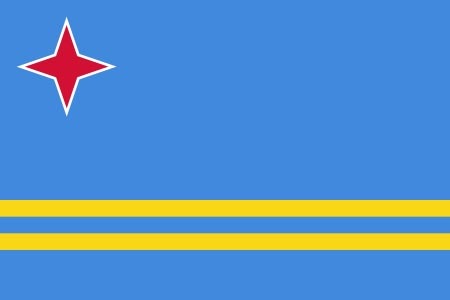 Aruba’s two official languages are Dutch and Papiamento.